Nerve Gardens - ZineWiki - the history and culture of zines, independent media and the small press. 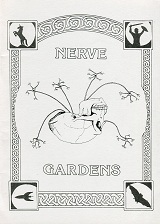 Nerve Gardens was a speculative and fantastic literature zine edited by Keith Jones and Barry Duggan from the United Kingdom. Two issues were released: #1, which appeared in the mid 1980s, and #2 (also undated, but likely 1987). The first issue contained fiction by David Jones, Marise Morland, and Mark Valentine (Aklo), and poetry by Andrew Darlington (Ludd's Mill), Walter de la Mare, Rose Lane, and Marise Morland. The cover art is uncredited, but interior illustrations were provided by Sidney Chapman, Stella Hender, and Neil Thomas. The second issue printed fiction by Colin P. Davies, Nick Daws, Tricia Gill, Tim Love, Andrew Sawyer, and Gary Smith, and poetry by Andrew Darlington, John Francis Haines (Handshake), Janet Anne King, Pam Mitchell, Marise Morland, and Andrew Sawyer. Cover art was uncredited, but interior artwork came from Colin Evans, Jim Garrison, Dallas C. Goffin, Stella Hender, Mark Samuels, Steve Skwarek, and Steve Sneyd (Data Dump).